Lightly insulated Coreloft™ Compact hooded jacket with air permeable side panels. Atom Series: Synthetic insulated mid layers | SL: Superlight. 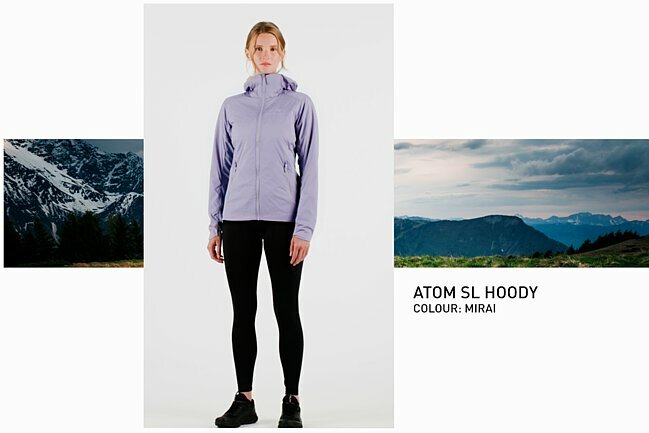 The Atom SL is designed to handle subtle climate shifts, and each of its fabrics is intentionally selected to manage moisture and provide comfort. Soft, easily compacted, and resilient, the Tyono™ 20 shell material uses fine denier yarns that allow a fabric configuration that is surprisingly strong for its light weight. Balancing air permeability with wind resistance, the material allows airflow during active periods, but helps cut wind chill during static moments. 40g/m² Coreloft™ Compact insulation is highly compressible, insulates if wet, permits airflow, and delivers its superior performance for very little weight. Sleeves are lined with a comfortable mesh fabric, and lightweight fleece side panels help provide thermal performance and ventilation. Articulated sleeves and gusseted underarms extend freedom of movement. Arc’teryx designers know that a thoughtful minimalism delivers more performance. Created to be so compact and light there’s no reason to leave it behind, the Atom SL has only necessary features and uses ultralight fabrics. The DWR (durable water repellant) treated StormHood™ hood is uninsulated, making it ideal for minimizing wind chill or providing protection in light rain. The trim fit minimizes bulk and layers easily, and the insulation is placed only where it’s most needed, in the core, to reduce weight and bulk without sacrificing appropriate thermal performance. The result is a hoody that provides efficient shoulder season insulation, stuffs to the size of a grapefruit, and weighs a mere 235 grams.